Overlooking Combesgate Beach at the northern end of Woolacombe Bay stands the Pebbles Court development. It is so conveniently placed to walk down to the great surfing beach below, favoured by locals avoiding the crowds on main beach and known for it’s rock pools, sandy broad beach at low tide and topped by the grassy banks great for kite flying, picnicking or sunbathing A first floor apartment yet with just a few outdoor steps to being otherwise level with the car park, it has easy access from its own parking space. Sleeping 4 in two bedrooms, 6 Pebbles Court remains a family favourite amongst many returning guests. 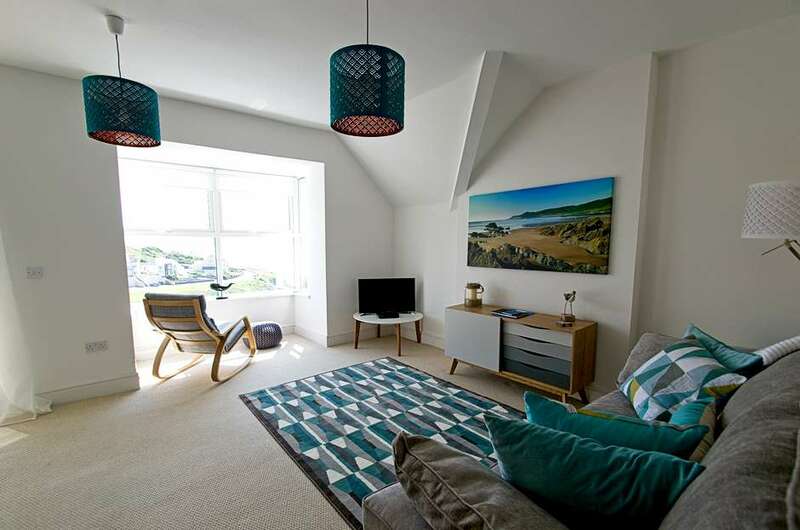 The sunny south facing living room has breathtaking sea views from the large bay window and balcony. The View is ideal for watching the sea and surf. There is a large squashy sofa to relax into after a busy day on the beach and two rocking chairs to rest in and look out at the ever changing seascape. The dining area is by the balcony doors so you can enjoy the sea view whilst you eat. There are two chairs and a side table for the balcony, perfect for relaxing in the sun. The good sized kitchen is well equipped with a dishwasher, fridge and freezer and a washer dryer. In the living room the sideboard is full of DVDs and games for when the weather isn't too kind and a cupboard with buckets, spades, wind breaks and beach chairs for when it is. There is a TV and DVD player and unlimited Wi-Fi. The double bedroom has an en-suite shower room and the twin room has use of the family bathroom with bath and shower over. The twin room also has a collection of toys and a TV and DVD player. Both have fresh white bedding and snuggly duvets and pillows. A £150 security deposit will be pre-authorised and then released again after the holiday. The “Wow” factor of this apartment is the view as you step into the main room it confronts you. The apartment is convenient for the beaches of Combesgate below with steps down, Barricane just a 5 minute walk and main beach about 15/20 minutes walk on the flat. The village is just a few minutes further. There really is no need for a car so park up and enjoy a stress free holiday in a secluded spot yet so near to everything you need.